Wouff-Hong. From 1938 ARRL Convention. Formerly belonged to Fred VE3HC. I checked my backpack once again; just to be sure it was still there. It was, and its finish though now dull, still bespoke of a proud past. Of my radio purchases over the past 5 years, this simple item, purchased for less than one would spend on a lunch, had eclipsed them all. Let me explain. On August 14, 1999 Bill K2LNU and I attended the moving sale of our friend, Fred Hammond VE3HC in Guelph, Ontario. I had first met Fred 4 years ago, when I was still quite new to the hobby. Fred, licensed since 1929, had established and maintained the outstanding Hammond Museum of Radio in his hometown of Guelph. Bill and I, along with many others, had become frequent visitors to his museum. His warm “V.. E.. 3.. H-Henry..C-Charlie” had greeted me several times on 75 meter AM as a return to my call of “CQ”. However, in 1998 Fred sadly suffered a stroke, and although recovering, has been absent from the air. At the sale, much of the gear was quickly snapped up, but a garage full of cardboard boxes containing radio parts was left largely untouched. You know the type of the boxes I am speaking about, the kind found under the tables at many a hamfest, covered with alternate layers of dust and grime, so often overlooked by those in quest of more “glamorous” finds. I have always found such boxes truly the proverbial diamonds in the rough, time capsules of radios rich legacy. Needless to say, I was soon busy rooting around in the parts boxes in the garage, boxes that had caught the attention of only a few other amateurs. I saw a nearby ham pickup, examine curiously and then return to the box an odd shaped metal object. The size and shape certainly looked familiar, but I discounted it, as I would never expect to find such in a box of radio parts. Still, my own curiosity now peaked, I walked over, bent down, and picked up the item for myself. Yes, I thought, as I carefully turned it over in my hands, it really is. 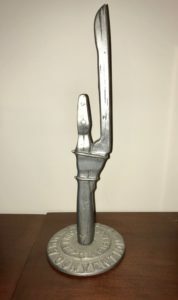 Although the once shiny finish was now discolored with age, and caked with decades of dust, there was no mistaking the classic form; it was a “Wouff-Hong”. Beginning in 1917, stories by an anonymous writer using the pseudonym “The Old Man” , abbreviated as “T.O.M.” began to appear in the American Radio Relay League’s (ARRL) monthly publication QST. Titled the “Rotten Radio” series, they harshly assailed and exposed the poor operating practices of the day with caustic satire and humor. It was in one of these stories, entitled “Rotten QRM”, that T.O.M. blasted the gibberish he’d overheard in one particular QSO, citing as an example the words “wouff hong”, which apparently was either a concocted abbreviation, or someone’s poor attempt at sending. At the time of the articles T.O.M. did not know what a Wouff-Hong was, but he later adopted it as a disciplinary object with which to both flail bad operating practices and inflict punishment on the perpetrators. 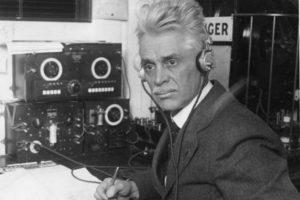 It is said that in the following era he had, tongue in cheek, proposed its use as an instrument of torture and discipline, to maintain decency and order in the ham radio community. It was early in the year 1919 that T.O.M. contributed an article to QST called “Rotten Starting”, criticizing the slow progress of the United States government to allow hams to operate again after World War I. It finished with “I am sending you a specimen of a real live Wouff-Hong which came to light when we started to get our junk out of cold storage. Keep it in the editorial sanctum where you can lay your hands on it quickly in an emergency. We will soon be allowed to transmit, and then you will need it.” Accompanying this article was a misshapen, wooden, wire-bound two-pronged tuning fork-like object. Yes, the Wouff-Hong. Only after his death, was it was revealed to all that T.O.M. had actually been Hiram Percy Maxim, the founder and first President of the ARRL. It is said that he took the secret of the origin of the first Wouff-Hong to his grave. And here, in my hands, was a Wouff-Hong, long considered amateur radios most sacred symbol of law and order. Cast into its base were the words “ARRL National Convention Chicago, IL Sept 3 4 5 1938”. I was holding an artifact from the Golden Age of Radio, made some 61 years ago. I found myself thinking back, wondering about the person that had brought this back from the Convention, now some six decades into the past. What were the concerns and thoughts of this fellow radio amateur a few short years after the Great Depression? Would he even recognize the hobby today, and what would he think about radio signals now being passed through satellites, computers, and even the Internet? Had radio fulfilled its once bright promise? Would he find today’s amateur holding to the high principles of the past? I had to wonder if he would be pleased by what he found, or somehow sadly disappointed? Indeed, how would T.O.M himself see things? Would his famous “Rotten Radio” articles still be written, and if so, who or what would be the targets? Had we won the technology battle, only to lose the war for the spirit of the hobby? Startled back to reality by the crash of a carelessly dropped metal panel upon the garage floor, I again considered my find. Possibly this “Wouff-Hong” was some sort of souvenir, or perhaps an award handed out at the Convention, I still have to research the exact origin. Delighted, I paid the requested $5 for the item, and carefully placed it with in my backpack for safe keeping until the sale was over. $5 was indeed a cheap price for a journey back into radios past, affording me the opportunity to examine my own beliefs and hopes for the hobby. Did this “Wouff-Hong” at one time belong to Fred VE3HC, or was it simply a museum piece carelessly discarded into one of the boxes, discarded and forgotten by a generation that often pays little tribute to past? That question has yet to be answered, but to me, the origin of the piece is not as important as the meaning attached to it, the rich, proud legacy of a magical hobby and the remembrance of a friend.